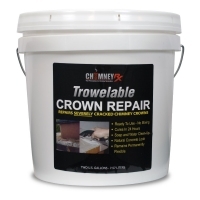 Chimney Rx Trowelable Crown Repair can be used wherever a long-lasting exterior waterproof membrane is needed. DEFY Trowelable Chimney Crown Repair is an elastomeric coating that forms a flexible waterproof membrane over the surface of the crown. It is specifically formulated to repair and protect chimney crowns from water intrusion. It can also be used for a variety of horizontal and vertical exterior waterproofing applications. It dries to a natural concrete/mortar appearance. DEFY Trowelable Chimney Crown Repair is an extremely long lasting and durable coating that requires no mixing or special bonding agents. DEFY Trowelable Chimney Crown Repair can be used wherever a long-lasting exterior waterproof membrane is needed, such as chimney crowns, chimney corbels, the tops of masonry walls, including parapets and stucco repair. Other uses include masonry window sills where bricks are laid in a soldier pattern at the base of the windows. It can be used as a bonding mortar to replace badly spalled brick units or for parging over brick faces that may have spalled, if remaining brick is solid. It can also be used for crack repair, surface grouting and tuck pointing. DEFY Trowelable Chimney Crown Repair can additionally be colored using small amounts of standard mortar dye. Add mortar dye one or two drops at a time and mix with trowel or paddle mixer and drill until desired color is reached. Tip: To produce a clean edge and protect the brick just below the crown, place duct tape completely over the face of the top course or row of brick. Tape can also be applied to flue tile to produce a clean edge for DEFY Trowelable Chimney Crown Repair. Remove tape when application is completed.